Today I learned about some studies looking at social networks constructed from bibliographic data (from Mark Newman, see Newman 2001 or Said et al. 2008) . 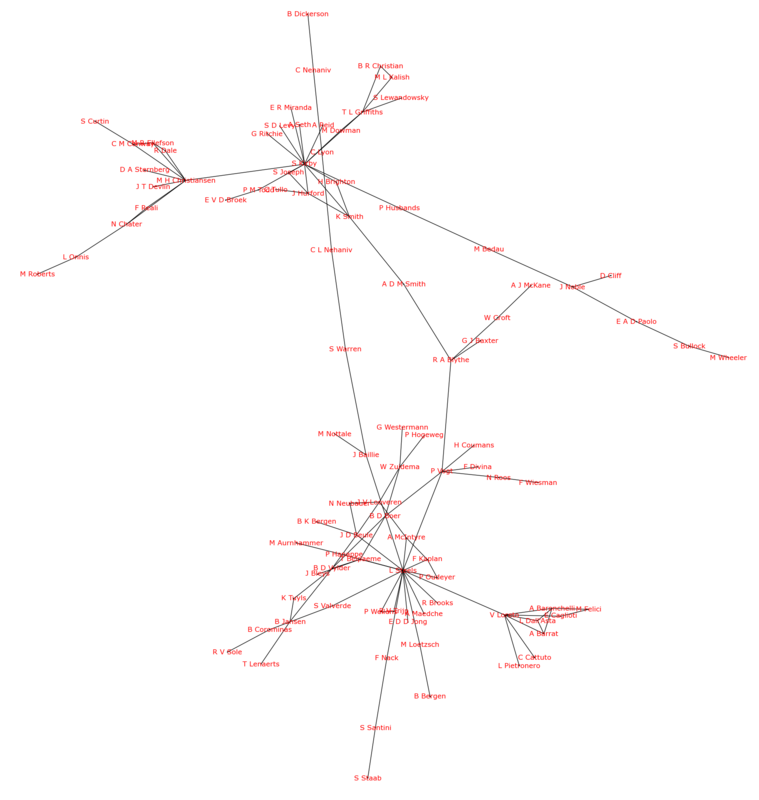 Nodes on a graph represent authors and edges are added if those authors have co-authored a paper. I scripted a little tool to construct such a graph from bibtex files – the bibliographic data files used with latex. The Language Evolution and Computation Bibliography – a list of the most relevant papers in the field – is available in bibtex format. You can look at the program using the online Academic Networking application that I scripted today, or upload your own bibtex file to find out who the movers and shakers are in your field. Soon, I hope to add an automatic graph-visualisation, too. A good measure of importance in the network (even better than page rank) is simply the degree- how many people you are connected to. 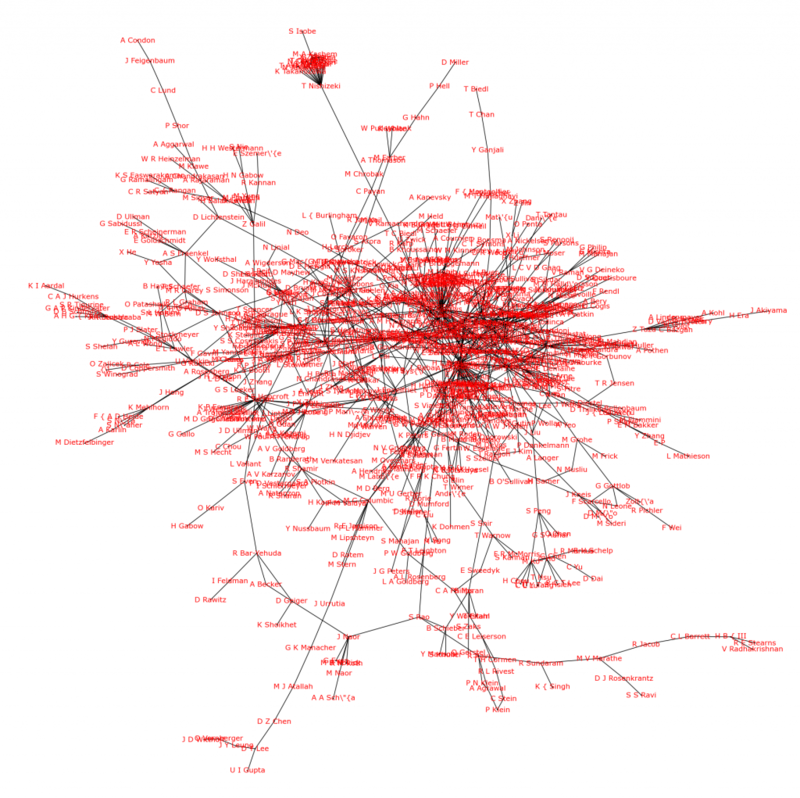 We can look at the top ‘brokers’ – authors that are vital links between clusters in the network. This is calculated as the highest betweenness-centrality. It seems like the field of network theory is more collaborative than language evolution! Using my own bibliography produces expected results, except that it suggests I should try and collaborate with broker Brian Hare, who’s published with Michael Tomasello. However, this seems to be the result of a 7-author paper. This may mean it might not be useful for fields such as biology where there are typically many authors on each paper. The future algorithm should correct for that. For instance, I haven’t made the edges weighted, and I could modify the weights by the number of authors on a paper. Add your own bibtex files to the online Academic Networking program – no guarantees it’ll work, though! I used python’s networkx module to calculate the statistics. You can see the script here. I can imagine many additions to this, but will leave it for another time. You could probably use Mendeley for this. Do you have a Mendeley account, yet? It would be easier than a non-crowd-sourced bibtex file.